The Labyrinth: A Holy Place | Words of Wisdom? When our heart is in a holy place. One of the five pillars of Islam is the requirement that, at least once during every adult Muslim’s lifetime, if they are able, a pilgrimage to the Holy Land of Mecca must be carried out. This ritual journey is representative of Muslim solidarity and devotion to Allah. The five day period of Hajj this year began yesterday. Many of the world’s religions encourage undertaking a pilgrimage to a holy destination as a way of deepening one’s connection to their faith and with the Divine. The ritual of embarking on a physical journey to a sacred place can be both inspirational and transformational. The labyrinth is seen by some as symbolic of a religious pilgrimage. It is speculated that the one at Chartres Cathedral in France has been considered as such, as early at the 13th century. 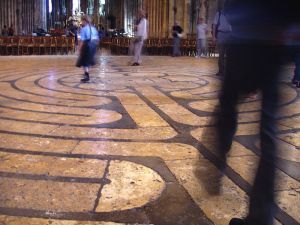 Walking the winding-yet-defined path toward a single destination, one has the opportunity to connect with Spirit, allowing oneself space and time to listen for the voice of God… If you are open to fully embracing the experience of it, the labyrinth can indeed be a holy place. Many of us make our own annual pilgrimage, although we may not consider it as such. Do you travel for Thanksgiving, to break bread with extended family? At Christmas, to visit a beloved grandchild? During the summer, to a favorite destination – perhaps the mountains or the shore? Although not prescribed by any chosen religion as necessary, these, too, are journeys that serve to nourish our souls and fulfill a spiritual need within us. These, too, are “holy” destinations. Is there a physical location that fills this need for you; somewhere that resonates personally as a sacred, holy place? When your heart is in a holy place, where are you apt to find yourself, geographically? This entry was posted in The Labyrinth and tagged faith, Islam, journey, searching, transformation, UU 4th Principle. Bookmark the permalink. I really needed to read these words today. Thank you for writing them. Thank you, Peggy. I’m glad they spoke to you. This was so helpful for me! Thank you for your words!